A Mater design always has several good sides: Functionality, Aesthetics and Ethics - and with Double Bottle, the function is even multiplied by two. The unique carafe, designed by architect Eva Harlou for Mater, is a real two-in-one and a surefire conversation starter on the table. Two simple carafes in borosilicate glass (the extra heat and cold resistant glass that is also used in laboratory works) are merged. 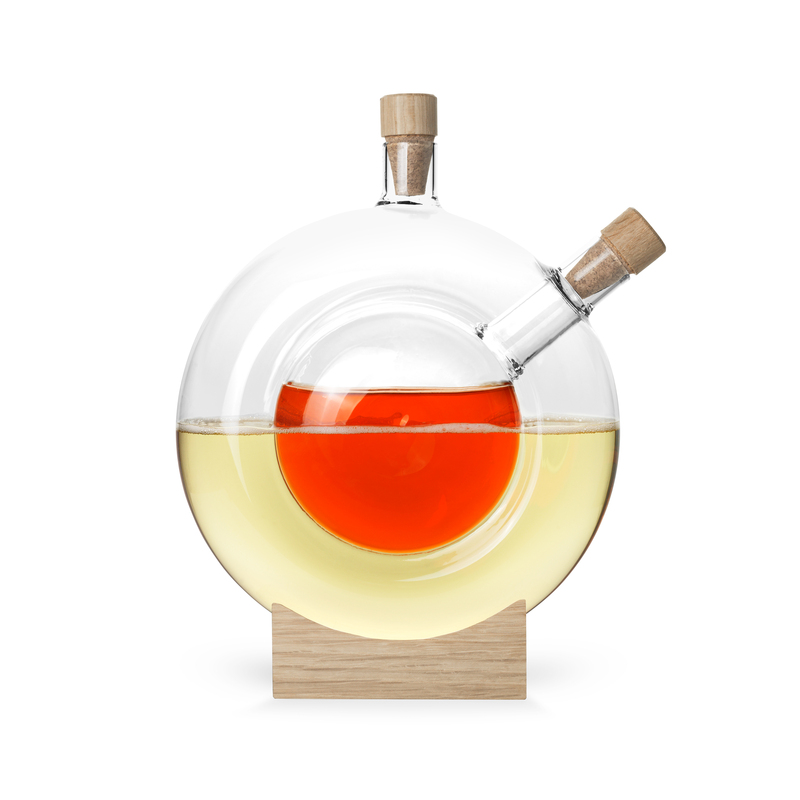 The little carafe is implemented in the larger, and the set rests elegantly on a foot of FSC certified oak. The outermost carafe is additionally the handle of the Double Bottle, which gives a good grip on things, whether you're pouring from one or the other neck. - The design is based on the desire to make something that is really functional in connection with tableware. It has become a product that has never been seen before. Double Bottle is a design that appeals to both father, mother and friends; for both children and adults, and I think it's great that you can get around a design like that, says architect Eva Harlou. Serving Aperol and Prosecco from Double Bottle for an aperitif, red and white wine for dinner and ending with gin and tonic served in a particularly refined manner. There is of course also the opportunity to offer water with and without bubbles - from the same carafe.